How is it possible that the Republican Governor can spend billions on road widening in a State with a Democratic majority in both chambers of the State House, chambers which had voted for gas tax increases to fund transit? This question has vexed residents of the Baltimore metro area ever since the Governor nixed the $2.9 billion Red Line rail transit line and has since spent money for added transportation capacity only on roads. (Except for the small State portion for the Washington area Purple Line). 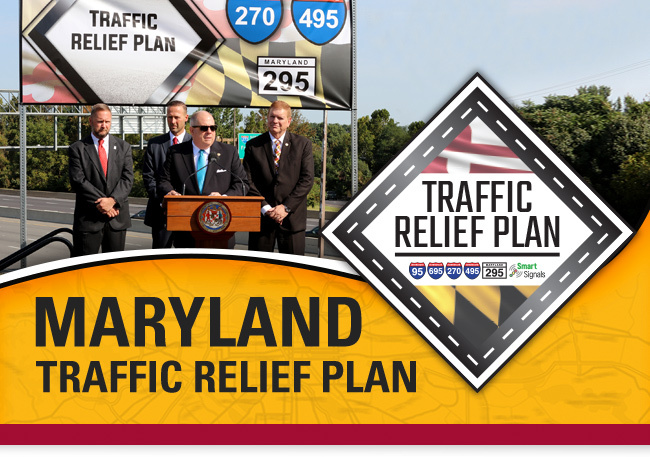 While Maryland has a strong Governor in terms of how the balance of power is assigned, federal transportation and state smart growth laws put many hurdles in the way of just one person deciding how transportation should be done. Shouldn't those prevent such lopsided outcomes? For example ISTEA: Under George Bush senior the federal government enacted the Intermodal Surface Transportation Efficiency Act, in essence an authorization bill for federal transportation money, as there have been many before and after. However, ISTEA as it became known, was a landmark bill in that it recognized that prudent transportation policy has to look at all modes of moving goods and people in an integrated way, across a regional area and with land use, air quality and effectiveness of expenditures in mind. Transportation experts were jubilant, because they had long demanded that these topics come out of their silos and the question no longer be only, how to make cars move faster, but how to move goods and people in the most efficient and most healthy and sustainable way. 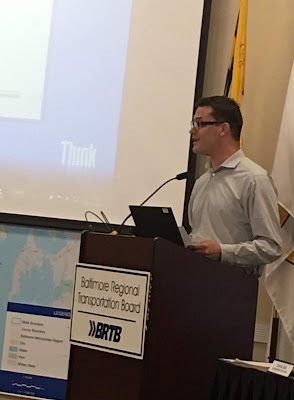 To investigate the complicated process how money finds its way to actual transportation projects, I attended the recent meeting of the Baltimore Regional Transportation Board (BRTB), when its main agenda item was the $1.1 billion toll lane expansion north of MD 43, the current endpoint of the already existing toll lanes. More precisely, the BRTB had to decide whether this project should be added to the Transportation Improvement Program (TIP), a necessary step before a major transportation investment can occur using federal funds. Most people probably have never heard of the BRTB or of TIP, or any of the other many acronyms floating around in transportation politics like storm-debris on the Chesapeake Bay. Many of those terms go back to ISTEA, It mandated regional transportation planning organizations such as the BRTB and required analysis to precede construction of facilities. Every entity that was supposed to guarantee that transportation money is spent wisely has learned to jump through all the regulatory hoops and still pursue exactly what had always been done before. Thus, long-term transportation improvement plans, regional coordination, clean air and major investment studies get produced to prove that the proposed road widening improves the air, is good for the region, for air quality, the environment, safety and the best way to achieve mobility. In other words: We now spend more time and more money to get the exactly same results as 1991 and before. First with breakneck speed: The time from announcement to the planned completion in 2022 is only five years. (By comparison, the $2.9 billion Red line was planned and designed for 13 years, not including construction). That the project wasn't included in the Transporation Improvement Plan (TIP) even though that plan had just been approved in July of 2018 was a flaw that the recent meeting was to rectify with resolution 19-5. It is notable that the TIP totals $3.198 billion for a three year period.ending in 2022. The amendment adds a about a third to the expenditures of the entire region, a bit less if one allows that the lane project may still draw money in 2023. The one third "amendment" to the TIP had its own public meeting, short public comment period and determination that the plan was in compliance with the Air Quality requirements of the Clean Air Act. references to accidents and congestion as the main drivers for the investment remained unsubstantiated and unchallenged. Second with a largely uncritical BRTB. Although its citizen advisory committee (CAC) rejected the amendment with a split vote, the members representing the various regional transportation agencies had little to discuss. There was a brief question about how the I-95 improvement projects were selected and a another one about how well the completed portion of the toll lanes perform and a question about how the improvements for Port Covington are funded. That was all the scrutiny the board could muster. 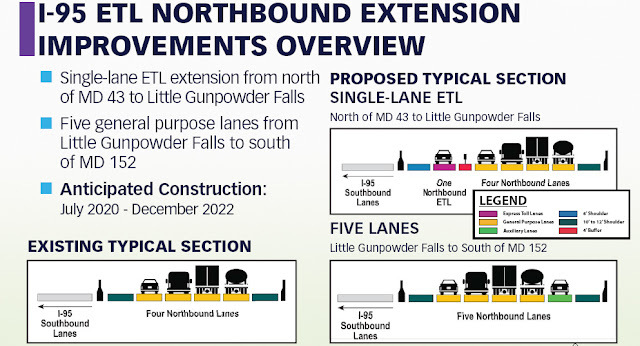 The response to the performance of the existing toll road section that "the segment outperforms expectations" and that up to 44,000 vehicles use the four additional lanes per day satisfied everybody, even though this volume is below capacity by a factor of 2 or 4 (the four lane I-97 has an ADT of 160,000) and no dollar figures regarding revenue or "return on investment" (ROI) were provided. Third, with the State stacking the deck in favor of the single occupant automobile: In response to a BRTB question how the toll lanes were identified as the most appropriate way to solve regional transportation bottlenecks, the response was that the Maryland Toll Authority (MdTA) can only spend its funds on its own toll roads. This eliminates pretty much everything else except the Bay Bridge (which has its own expansion study). The toll revenue in 2017 was a whopping $670,760,000 in 2017, an increase of $26 million over 2016. When asked why high occupancy vehicles and vanpools couldn't drive free on the new lanes like in Virginia, BRTB members were told that Virginia reimburses its private operator for those tolls and that such use of revenues isn't allowed in Maryland. No word, though, that the I-95 toll lanes would be operated privately. Fourth: Circular logic: Maybe the most telling moment came, when the Harford County representative rebutted the CAC critique of the project as solely auto oriented with the observation that transit was way too limited to divert any significant amount of traffic. The board member compared 450 train passengers with the 44,000 cars on the current toll lanes. He has a point, but with that logic transit will continue to starve and roads will remain to be king. The Baltimore region is classified as marginal non-attainment for the 2015 Ozone National Ambient Air Quality Standard (NAAQS) and moderate non-attainment for the 2008 Ozone NAAQS, and must work to ensure the region maintains conformity with the state's air quality plan; The Congestion Mitigation and Air Quality Improvement (CMAQ) program was created to provide funding for transportation programs and projects that reduce air pollution and mitigate congestion from the transportation system, and this funding is provided to state and local governments to assist them in reaching federal air quality requirements established by the Clean Air Act. The BRTB didn't need much time to adopt CMAQ Performance Plan 2018, even though confusion about how those improvement targets were calculated was obvious from some of the questions and even from the response. It went something like this: Congestion reduction is calculated via formulas as emission reduction. Since the multitude of measures planned in the TIP has not been individually modeled for each case, the sum total of all planned benefits is simply extrapolated from the past calculated improvement. No specific projects to improve air quality such as higher transit mode shares, active modes, or transportation electrification measures were mentioned. A frequent complaint regarding the Baltimore Metropolitan Council is the dominance of suburban and rural jurisdictions which can out-vote the two municipalities on the BRTB any time. The lone voice against the I-95 widening concept came from the representative of Annapolis, Sally Nash. The representative of Baltimore City is DOT Director Michele Pourciau. This year it is her turn to chair the meetings. According to the parliamentarian rules, the chair doesn't vote except as a tie breaker. The I-95 measure passed the BRTB 12-1. After the Maryland Transit Administration's collaboration with the mobile app "Transit" MTA's which allows riders to see the location of their bus in real time, MTA has now taken the next step into the 21st century with CharmPass, a mobile transit pass app that makes it faster, and easier for transit riders statewide to purchase fares for all of MTA's services, including MARC, Commuter Bus as well MTA bus, Light Rail and Metro Subway. The biggest innovation is that with CharmPass riders get a free 90 minute transfer without extra charge. The app is available for download and can be used starting today. The MTA announced the innovation Thursday at 11 am in front of Penn Station. “This new mobile ticketing app is another way we’re working to improve our customers’ experience on transit,” said MDOT MTA Administrator Kevin Quinn. “CharmPass is an innovative tool that will eliminate the need for people to fumble with cash, which will help speed the boarding process and improve reliability.” He was flanked by MDOT's Ricky Smith, Tradepoint Atlantic's Aaron Tomarchio and Robin Budish of Transit Choices. With the help of the new app transit riders can purchase tickets right from their smartphones for one-way, 1-day, 7-day and 31-day passes; Tickets can be paid using a credit or debit card or PayPal. Transit riders can split charges between two credit or debit cards. The MTA says that reduced fare tickets for senior and students, for example can be purchased this way. The app streamlines repeat purchases and makes tickets available immediately to the user. Mobile tickets are activated by the CharmPass app and must be shown to the operator, conductor or at Metro to the station attendant. Tickets that are activated become animated and contain multiple security features including security codes that change daily. Operators may instruct transit riders to tap the screen to verify that the ticket is valid. When tapped, the screen changes color. Expired tickets turn gray. Since tickets are stored on the phone, they can also be activated where the phone is not connected to the Internet. The introduction of mobile ticketing is the latest round of reducing one of transit's persistent access hurdles, the ticket purchase. This hurdle is especially high for the occasional rider who is not familar with the complicated fare boxes, the fare structure or the types of tickets which are sold and loath to face all these complications while in line to board a bus. Additionally, cash transactions in front of the bus driver slow the bus down for extended periods of time, especially when dollar bills are repeatedly rejected by the fare collection machines. The MTA is one of several transit agencies utilizing smart phones for tickets. However, Washington's WMATA abandoned its plans for mobile ticketing last year, Paul Wiedefeld, a past Administrator of the MTA said, that the market wasn't there yet. At the MTA, for now the option to pay by cash, have paper passes or use the electronic CharmCard remains as well, a panoply of options that is in itself confusing, especially for operators. Transit experts recommend that agencies would go cash-less as a simple way to accelerate bus service. One day a single mobile app will replace all other fare purchase options. Hopkins University President Ron Daniels knew perfectly well that the invited architect wouldn't be the enfant terrible which he was at 34 when he won the Centre Beaubourg in Paris design competition together with Richard Rogers in 1971, but a now internationally celebrated superstar who, at age 81, is less likely to rock the Hopkins boat. 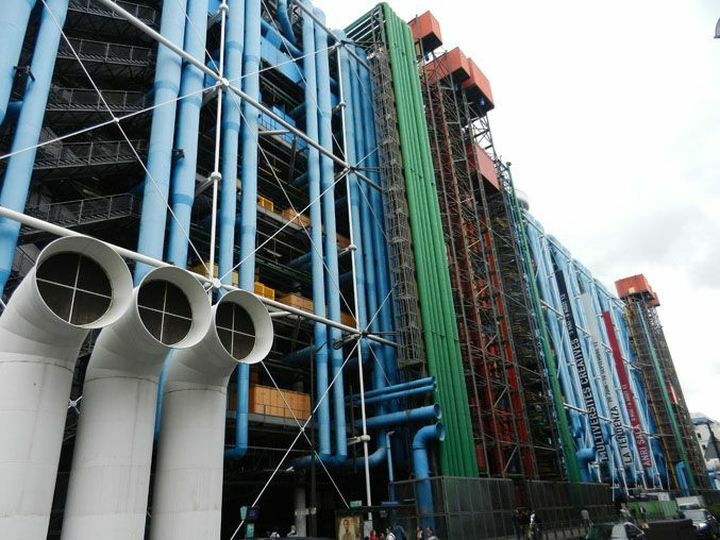 Yet, in a discussion with Renzo Piano, on short notice arranged on the Hopkins Campus on Monday and titled "The Role of Architecture in Civil Society", Daniels, who is 59 but looks like 44, tried several times to elicit the reverberations of the disruption the industrial looking Beaubourg had provoked in Paris and beyond. The most provocative thing the star architect finally said: "So it looks like a refinery? Yeah, why not?" Renzo Piano is spry, witty and very well mannered, a perfectly fine dinner guest. His native tongue is Italian, he lives in Paris and builds all over the world. He had no trouble producing any number of print-ready English statements about architecture and the role of architects. ("Life is not what you have done but what is still to be done"). Recently Daniels had dinner with Piano in Athens since the Piano designed cultural center there is named for and funded by the same Stavros Niarchos Foundation which will also fund the envisioned Hopkins Agora project. (The Foundation also funded a large portion of the Parkway theater renovation on North Avenue). The Athens Center has already advanced to second most visited attraction in Athens after the Acropolis. 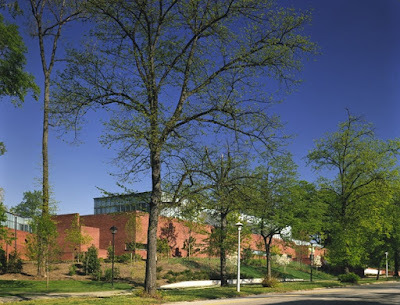 Clearly, Hopkins is trying to direct some of the architect's glow to Baltimore by announcing last week that it had tapped the Renzo Piano Building Workshop (RPBW) as their architect. Daniels grabbed Piano's elbow so often and looked at him with such adoration, that in a different constellation, it could have constituted harassment. Having the indefatigable man's fame rub off on the Hopkins institution is clearly the goal, even though the university's small 35,000 square foot interdisciplinary center, dedicated to the idea of strengthening democracy through civic engagement and discourse worldwide is tiny compared to the $800 million, 1.28 million square foot Greek project. In Greece the architect moved a mountain, what can he move in Baltimore? Students and MICA President "Sammy" Hoi got to ask the master some questions. All centered around how Piano can unite a divided Baltimore, or more modestly, how the programmatically themed "agora" building could unite people. Piano noted that as an architect one has to understand shifts in society "as a builder" and "you need to be bit a poet". "It’s a constant struggle", he said, "it looks obvious but it isn’t. Listen to the people is at the center." He also allowed, a bit more to the point, that it is "important to understand the relationship between the city and the university". 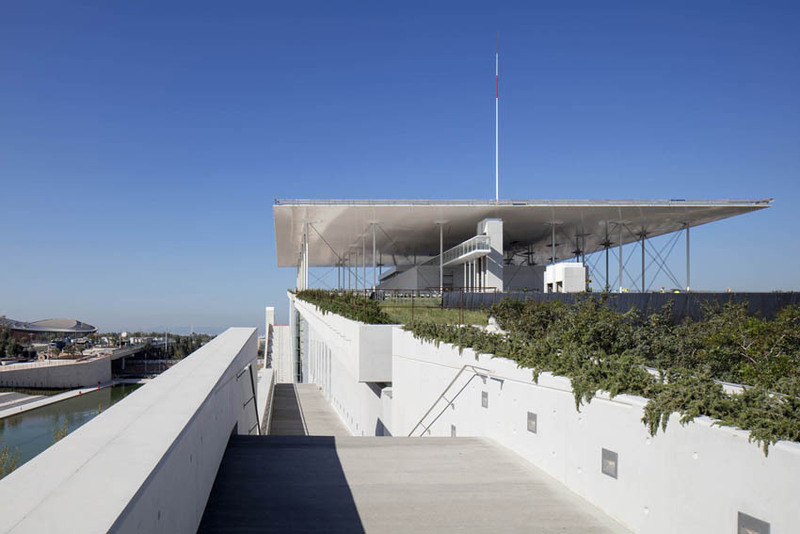 He mentioned his Palais de Justice on the northeast edge of Paris, the "banlieue",a giant project that somehow is supposed to provide healing between the healthy core city and its ailing edges. Under the gray and rainy skies of Monday's Baltimore Pritzker Prize winner Piano who currently is the star of a retrospective at the Royal Academy of Arts in London, had walked the Homewood Campus this way and that way to see what it would tell him. Piano and his American born partner Mark Carroll, apparently impressed be the dripping lushness of the Hopkins terrain, came away with the notion that "nature would definitely be part" of what defines the new building. Other than that they demurred and didn't say much about what they may have in mind. 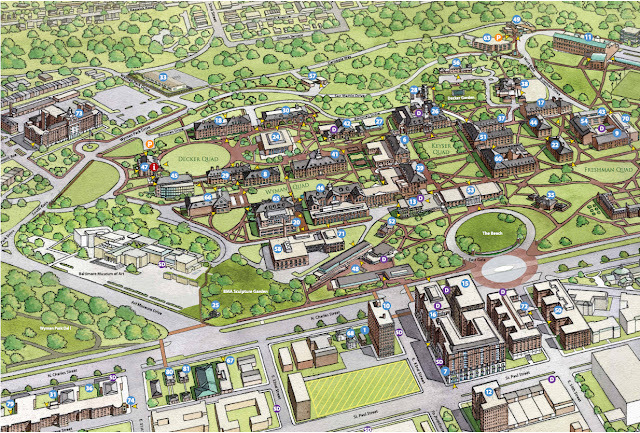 This isn't surprising, since the university still has to find a suitable site for the new center. First rumblings that the best location for a new statement may be the Mattin Center surfaced already in 2015 and caused some consternation among Hopkins and in the architectural community. The arts center was Hopkins' last attempt of harnessing architectural starpower when they commissioned internationally known New York studio of Tod Williams and Billie Tsien to design it. As the below description taken from the architect's website indicates, many of the very same objectives now on the table for Renzo Piano to crack were also part of the Mattin Center which isn't even 15 years old. 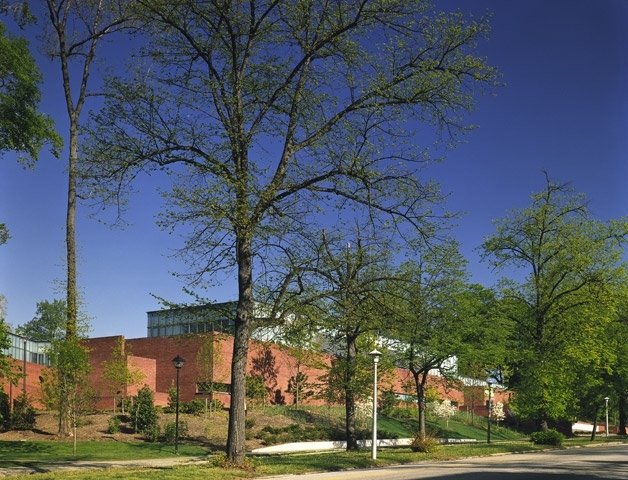 The Mattin Center at Johns Hopkins University is a place to nurture the creative arts in a school where the primary focus has always been science and engineering. Students come here in their free time to take non-accredited classes in dance, theater and the visual arts. In many ways, it functions as an impromptu student union. The center is composed of three buildings housing visual art and computer rooms, a dance studio, student offices, a black box theater, individual and group music practice rooms, and a café. Art studios open directly onto terraces. Large windows permit views into ground level dance studios. A brilliant green ceiling reflects light from a hidden skylight to a café below. Clerestory windows bring natural light to the student offices. The three structures are containers of life and light, and the triangulated plan sites the buildings close to each other, so people see other people working, creating a visual community. The buildings are cut into the existing slope of the site and act as retaining walls to create a sunken, sheltered courtyard. This is the heart of the project and serves as a place of passage, gathering, study, and meeting. The roofs of the buildings that form the courtyard are accessible terraces. A series of ramps and stairways connect the plaza and terrace levels as well as the Center to the Hopkins campus beyond. By cutting the buildings into the ground, the strong presence of the wooded knoll and the character of the existing Neo-Georgian architecture are retained. Hopkins campus: Where is the gateway? The new envisioned SNF Agora Institute is a 2017 initiative based on a $150 million gift from the Stavros Niarchos Foundation. As the BBJ described it "It is intended to be both an academic space and public forum that will bring together experts from diverse fields including political science, psychology, neuroscience, philosophy, ethics, sociology and history. It will facilitate scholarly research and experiments on improving civic engagement." The local architect partner for the prestigious project was announced on Monday as well: It is Ayers Saint Gross (ASG) of Baltimore, a firm nationally and internally known for its campus plans and architecture. According to Adam Gross of ASG, his firm has previously collaborated with RPBW on the Harvard Allston masterplan and on the Whittle School in DC. Added principal Stephen Wright: "the relationship with Renzo Piano is collaborative and isn't one where we are told what to do". Mattin Center: Are its days numbered? Asked whether there was room on the Hopkins campus for a new project without tearing significant buildings down, Hopkins President Daniels answered answered with a clear "yes". Right after the one hour discussion in Baltimore, Mr. Piano headed off to take the train to New York where his firm is together with SOM behind the masterplan for Columbia University’s Manhattanville campus in Harlem, slated for completion by 2030. Star architects are not allowed to get tired. Here, too, diversity, access and overcoming divisions will play a key role and the Italian is supposed to make the miracle happen. Amidst re-investment all around the perimeter, the former "Superblock" area on West Lexington Street in Baltimore's Westside, the former heart of retail in the city remains a large dead-zone day and night. Until last Saturday. 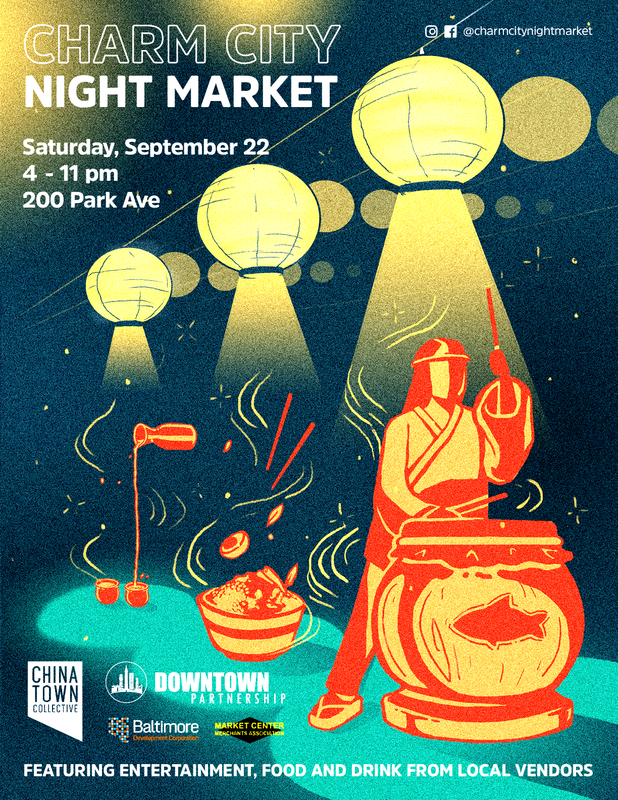 Baltimore's first ever "Night Market" put together by the Chinatown Collective changed everything, at least for one night. For one evening the Westside was teaming with thousands of young people who came to find out about the night market and what Asian culture has to offer. This wasn't just another ethnic festival, the location and the theme hit a spot and brought out a new set of people to an area in which they would normally never set foot. Phil Han, the 32-year-old Korean-American owner of the Mount Vernon restaurant Dooby’s gave the Baltimore SUN an entire theory why this festival was just the right thing at the right time, and she seemed to have it exactly right. "Some of the country’s most celebrated fine dining restaurants are Asian, and consumers of all backgrounds are more willing to engage with ethnic foods and drinks, such as the soju-based cocktail he’ll serve at the Night Market. [...] If you tried to do this five or 10 years ago, it wouldn’t be so easily accepted. [...]“But I think now you have this younger, millennial audience that’s maybe traveled, or gotten more exposure to the world … and I think it’s great they’re certainly more curious about things than ever before. Factor in the smash success of the movie “Crazy Rich Asians” this summer, and it feels like the Asian-American and Pacific Islander community is having a moment. U.S. citizens increasingly embrace their cultural identities, there couldn’t be a better time for this wide-ranging community to come together"
Luckily the Downtown Partnership and other established organizations such as the Market Center merchants saw the potential and supported the new group that had formed around the Chinatown Collective (see the details in the SUN article linked below). Night markets go back to a long standing Chinese tradition and also exist in several North American cities with a large Asian population or "Chinatown" such as San Francisco. The Milwaukee Social Architecture firm NEwaukee brought the concept of a market at late hours to its hometown as a method of reviving downtown. 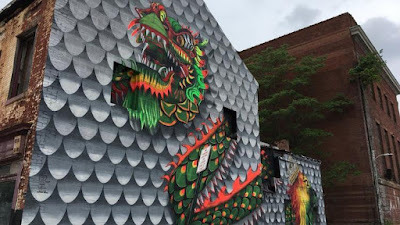 In Baltimore, downtown revival, the Chinese tradition, and Baltimore's historic Chinatown, now a single ailing block on Park Avenue flanked by another even more ailing block to the north and south, were tied together, an inspiration of the Chinatown Collective. Many of the longstanding urban activists such as Laurie Feinberg from the Planning Department, Dan Sparaco, Assistant Deputy Mayor under Stephanie Rawlings Blake's, Ridgely's Delight activist Bill Reuter, former Charles Street bookstore and coffeeshop owner Jimmy Rouse and many others were on hand to witness the miracle, with sparkling eyes recalling the City Fair as an early attempt of bringing people back to the city through a party. Most folks in the streets were not yet born when City Fair was a Baltimore attraction. The large crowds formed such long lines for Asian themed food stands that many sought their luck in the businesses further north on Park Avenue. For example in the Ethiopian restaurant that sits directly in the block that could still count as Baltimore's Chinatown. Many more ventured even further north, where abandoned sagging Westside blocks meet Mount Vernon. At the seam recently new apartments sprung up along Franklin Street and a while back, on the ground level of a converted Hochschild Kohn warehouse, which now houses also higher end apartments, the Mount Vernon Market. It was full to capacity from the overflow crowds, they could find Asian food here as well. The Trinacria restaurant right across the street from the market, was packed with those who rather stuck with Italian selections. Street in front of the former Read store. Meanwhile, the grassy lot that replaced a whole ensemble of historic stores on Lexington and Park was ground zero for the night market with booths lining the edges and a large stage presenting juggling, paper tigers and circus tricks. This lot is as empty as the "superblock" is vacant, because the Weinberg Foundation which owns it, is still waiting for the City owned block to the south to take off. The Baltimore Development Corporation has thankfully given up on the original full-block-all-in-one renewal idea. BDC indicates that several properties including the stately Barger Gutman building, will soon see re-use. New life in the old retail core of Baltimore is something that shouldn't last for only one night. The hunger of so many people to inject life into this particular part of town should reinvigorate everybody who has already despaired or manages the Westside in business as usual mode. Williamsburg in Downtown Frankfurt, Germany? About a dozen pedestrians are killed each year on Baltimore’s streets with another 900 or so being seriously injured, data of the city’s Department of Transportation reveal. 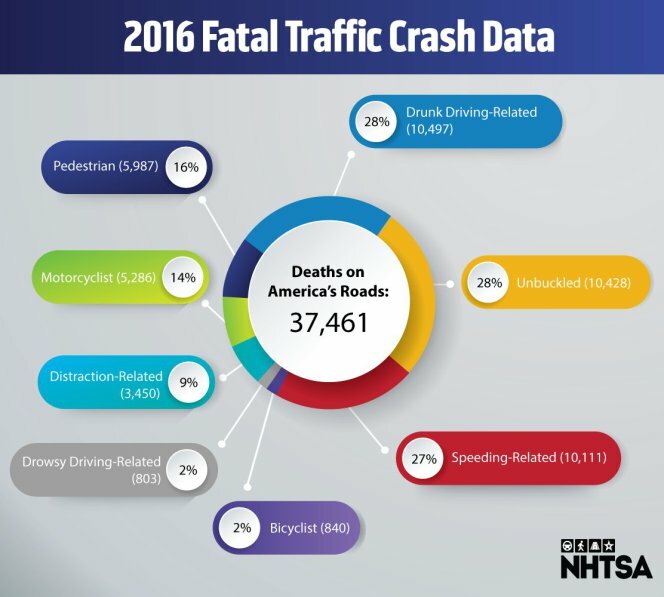 Transportation fatalities are never displayed as prominently as crime numbers while reducing them should be much easier. 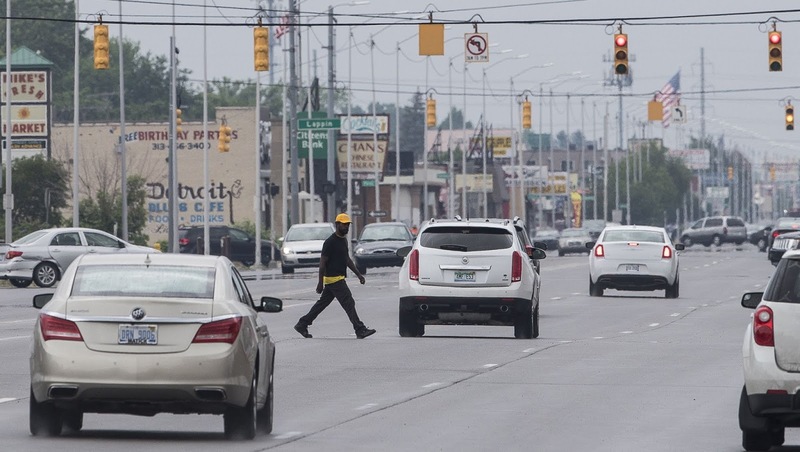 To some a 12 pedestrian fatalities may not sound much. But Baltimore doesn't compare well with other cities. Allstate Insurance ranked it recently dead last out of 200 cities based on accident claims. Compare the local fatality number to the global fatalities of commercial air traffic all over the world in 2017 (59 people died in air crashes)! While last year was the safest year on record for air travel, it was another year in a trend of rising traffic fatalities in Baltimore and pretty much everywhere in the US. 557 people died in traffic accidents in all of Maryland, but to pick up on a comparison of the Houston Gazette, if three almost full Southwest airplanes would crash each year at BWI, killing everyone on board, the airport would have long been closed down. There were an estimated 40,100 motor vehicle deaths last year according to the National Safety Council. (By the way, that is more than twice the US murder rate). If US air traffic would kill 40,000 people annually (that would be 291 fully loaded Southwest Boeing 737s, the entire air traffic system would have been shut down long ago). 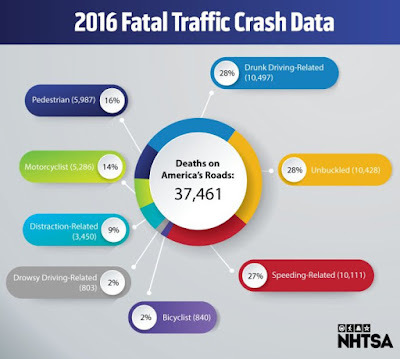 So why are those traffic deaths accepted as part of doing business and all efforts of doing something about them (speed limits, drunk driving checkpoints, radar controls, safe and better modes of getting around?) are seen as cumbersome intrusions into the freedom of drivers? It isn't that other countries have made much more progress. While air travel has become safer, US road traffic lately has turned into the wrong direction. More and faster driving in bigger and faster vehicles. Time to reverse the deadly trends. A new bill by councilmen Ryan Dorsey co-sponsored by 9 other council members (out of 16 total) wants to limit speed limits on Baltimore's streets to generally 25mph and in narrow residential side streets to 20mph. The two council members have previously gone on record for a new age in Baltimore's mobility by supporting "complete streets", "protected" bike lanes and better monitoring of dedicated transit lanes. All these are efforts that would make Baltimore safer. 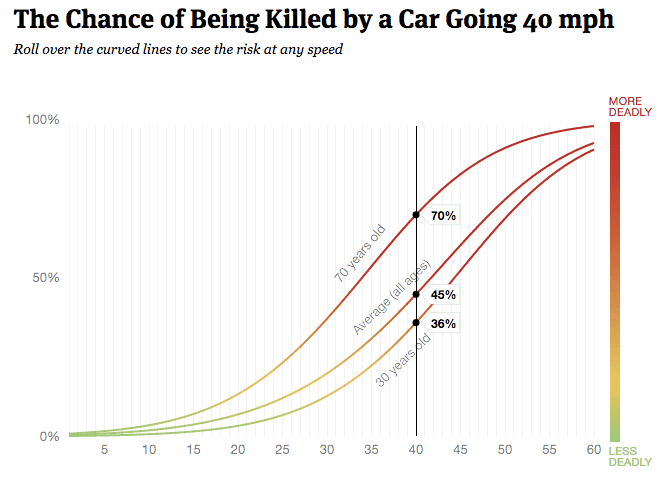 Speed kills: This is especially true inside cities and towns . This isn't a "war on cars" but a war on the frequently fatal abuse of cars on our streets. To make Baltimore a safer and more attractive place before autonomous vehicles will likely reduce crashes should be everybody's goal even if a diffuse SUN editorial casts some doubt.. 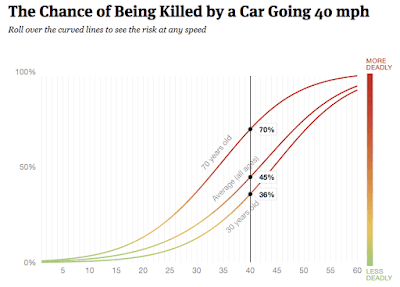 The risk of dying in a crash with a car grows exponentially with the speed of the car and its mass which in combination provide the deadly kinetic energy which gets unleashed on somebody who either also sits in a car, or is walking or biking in or near where a fast heavy vehicle is getting out of control, for whatever reasons. The vehicles in which people move around to do their daily commuting or errands have become faster, heavier and more powerful year after year after the last fuel price spike and energy crisis which had temporarily put a dent into that trend. Driving a car has become deadlier for everybody, even for the drivers of those heavy, fast monster machines, especially if they collide with an even faster or heavier one. Those who drive a tank in the assumption it adds safety for themselves, forget that once a heavier vehicles slides, slips or gets off the road, the much larger kinetic energy also works against the occupant. It is harder to control and on impact the reactive forces are larger. The cost of the car-centric transportation model is astronomic, not only in terms of lives and maimed bodies but also economically. There is lots of agony about why Baltimore has been in population and fiscal decline, why we have food and transit deserts and why so many are cut off from opportunity. Many of the causes are complicated and complex. But one single area sticks out as being responsible for many of those deficiencies: Transportation. With a drastic and courageous reversal of our failed transportation policies we can become quickly a model for livability and reduce cost in the process. Just think off that ill conceived $15 million dollar 4-lane bridge off HarborPoint which traffic engineers foisted on the City budget for no good reason. The Transportation Director likes to talk about finding a balance between the various users of streets. Things are so far out of balance in favor of cars, that to get balance a dramatic shift is needed. It can't come soon enough. A good test case would be the citywide new design speed not to exceed 25 mph which is proposed in the City Council. Or "North Avenue Rising" the current reconfiguration design of the 5 mile corridor from Hilton to Milton funded by a federal grant and MDOT money. The typical waffling and "congestion" arguments jeopardize even the most modest expectations. Not yet too late, to make the $27 million expenditure useful. (Public meetings will be held 9/26 and 9/27). A black culture district on Pennsylvania Avenue? Slowly the recognition emerges that a city with a nearly 64% black population cannot be turned around by the not even 30% white minority, nor should it be. White "saviors" coming in, often with the best of intentions, to revitalize the large neighborhoods in the vast disinvested neighborhoods that make up the so called black butterfly are no longer received with open arms. Artists often used to turn ailing communities around as progressive "urban pioneers" are no exception. It seems like a natural thing that Baltimore would have an arts and entertainment district that is devoted to black culture, especially considering that there are three such districts designated in the city. But none of those are focused on African American art and culture. 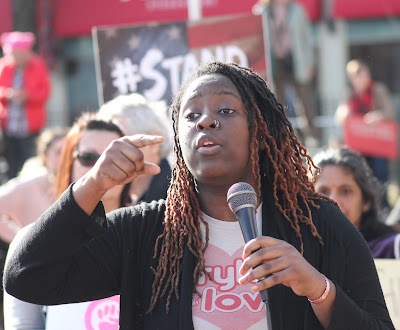 According to Brion Gill, a poet and African American art activist known as Lady Brion, Baltimore would truly be a leader if it did rectify this situation: According to her, there is not a single state-designated black A&E district in the entire country. Not all arts districts are state designated as in Maryland, but a quick search did not yield any specifically African American or black culture district, not even in New Orleans; truly astounding, if true. Maybe this issues takes some crowd sourcing. Historically, Pennsylvania Avenue was a hub for premiere Black arts and entertainment. The great Royal Theatre (originally the Douglass Theatre) welcomed legends like Ethal Waters, Louis Armstrong, Duke Ellington and Etta James. Black owned enterprise thrived on Pennsylvania Avenue like the first Black-owed movie house, Metropolitan Theatre, and the oldest continuously running Black male-social club, Arch Social cub. Black art is making headway in mainstream museums and Grammy awards lately as a Baltimore Magazine tally shows in an article this month. Brion Gill has found her quest for an African American Arts district on Pennsylvania Avenue echoed in Baltimore Magazine, the Afro and the Real News network. Her online petition has garnered over 1,100 supporters but a formal application has not yet been submitted to the Maryland State Arts Council. 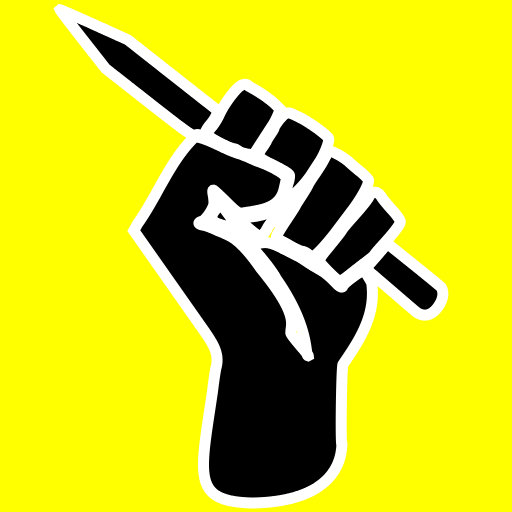 Gill is working with the for profit group Leaders of a Beautiful Struggle (LBS) to lay the groundwork for such an application which is planned to be submitted early in 2019. In a kick off event titled The Art of Activism: Building the Penn Avenue Black Arts District at Jubilee Art on the Avenue participants could listen to a panel discussion, live could and hip-hop performances or take part in workshops. An intentional Black arts district could rebuild the social fabric torn apart by gentrification and develop an arts/cultural rites of passage for upcoming artists and business owners. The district could be a central point for work that is already happening in the city and further community engagement. A Black arts district could aggregate financial resources to provide affordable housing and offer support to the community organizations and local businesses. Lady Brion served on Baltimore City Mayor Pugh’s Safe Arts Task Force in 2017-2018 formed to increase access to safe art spaces and activities in the Greater Baltimore area. Of the many recommendations submitted to the City of Baltimore, Lady Brion recommended that a Black Arts and Entertainment District designation be established along the Pennsylvania Avenue. Gill emphasizes a broad approach which takes art and links it firmly with economic development and with existing organizations which are active in the corridor such as the Upton Planning Council, the Druid Heights Community Development Corporation, the Pennsylvania Avenue Main Street organization and Baltimore Public Markets. The partnership also include the University of Baltimore, Fight Blight Baltimore, The Arch Social Club, Jubilee Arts, the Avenue Bakery and its owner's initiative to revive The Royal Theatre and the recently renovated Shake and Bake. The area of the district would include the northern portion Fulton Avenue and Pennsylvania Avenue with approximately a block east and west respectively. Programming events would be a large part of creating appeal, says Lady Brion in a conversation for this article. 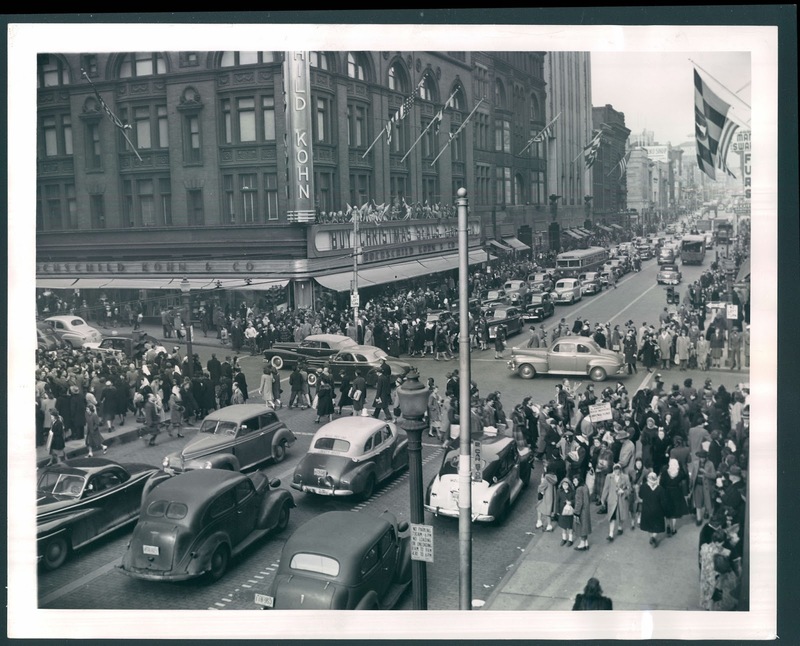 She mentions as an example the Cadillac Parade, part of a cherished tradition of having parades on the Avenue. The Cadillac parades dates back to the 1950s and was carried forth for about 20 years with attempts of revival in 1997, 2007, 2010 and 2011. (There may have been others). Gill is careful to define art and entertainment broadly enough to include sports such as boxing in the Upton Boxing facility. The group promoting the formation of an African American A&E district enlisted also the help of the Neighborhood Design Center which organized "Design Conversation" 92 about tactical urbanism employed for a better streetscape design on the Avenue. The Highlandtown A&E district thrived on the presence of the Cultural Alliance as an organized artistic anchor and has been buoyed by the influx of immigrants reducing vacant structures and adding economic heft. The Station North A&E district is organizationally propped up by the Central Baltimore Partnership with its strong anchor institutions working in tandem with well coordinated neighborhood associations. MICA, Hopkins, and the Deutsch Foundation stand out as having pushed this area forward. The Bromo district hasn't quite proven yet that it will work, but it has strong traditional art institutions such as the Hippdrome and the Everyman, has the support of the Downtown Partnership and is supported by an ongoing influx of downtown residents. A Pennsylvania Avenue corridor district would need to create stronger coordination of the various community CDCs and organizations working from a larger framework plan than their own individual neighborhood plans. The Upton area sees the most development interest, and has the most developed masterplan, but Upton is rather peripheral to the suggested A&E district or where it would likely have its center of gravity, probably somewhere between Triangle Park (Jubilee Arts) and Penn/North (Arch Social Club). Well know institutions of African American culture such as the Lewis Museum, the Eubie Blake Museum, and Blacks in Wax should ideally locate in the district where they could give each other support and synergy. Morgan University should have a branch teaching facility here, maybe in collaboration with Coppin University. More than anything else, Lady Brion's aspirations indicate that she envisions the arts as an economic engine and a tool of social empowerment. In many ways, this is quite different from the original world famous SoHo (NYC) approach in which artists were pioneering bridge heads for some type of "colonization". Station North with its Deutsch funded Open Works makerspace and its two artist live-work units developed by Jubilee give a hint what a economically oriented approach could look like. The vision of the West Baltimore Innovation Village points into a similar direction, a possible partnership that has not yet been formed. Baltimore's divisions and its segregation could be mitigated better if black culture would be better known and understood, especially by other cultures but also by African Americans themselves. The A&E district could be a great start for such a cultural exchange. The Real News 7/3/0/18: What Would A Black Arts and Entertainment District Mean for Baltimore? Afro 10/5/2016: We need an arts and entertainment district centered on the socioeconomic growth of Black people instead of solely utilizing their talents for entertainment. With so many vacant houses, why is there still a housing crisis? Hollywood, politics and capitalism all were run by rich white men for too long. While the former two have added some diversity, big business is still firmly in the same hands. The high-flying icons of America's tech economy are all white men. Their names are Bill Gates, Mark Zuckerberg, Jeff Bezos, Elon Musk, Michael Bloomberg and more locally, Kevin Plank. In a time when government abdicates more and more of its responsibilities and emasculates itself not through gender equity but through de-funding itself via popular tax cuts, the role of those industry icons moves into focus. As "impact investors" or "social entrepreneurs" they become even more powerful by playing outside the traditional lanes. In the age of cities with more than half of the global population living in metro areas with mayors seen as the ones who can save the world from national leaders running amok, cities have become also the arena for the very rich to try their social skills. How much of that is happening in Baltimore? The spectacle of Amazon's Jeff Bezos playing cities with his HQ2 game is an obscene example for traditional industry power play. But Bezos' offering up $2 billion to address homelessness is much harder to gauge. 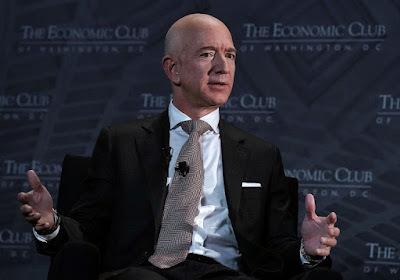 How much he attracts public attention was on display when King Amazon came to Washington this week. Almost as big a deal as a visit from the Pope. 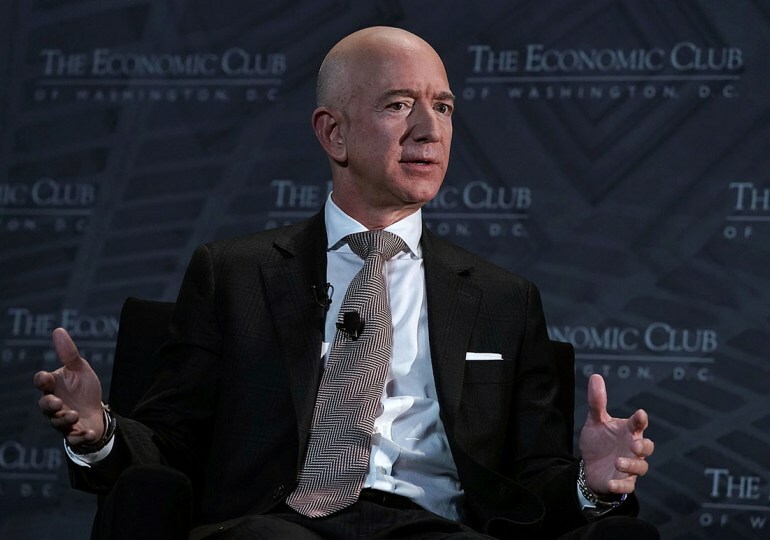 1,400 business leaders packed ballrooms at the Washington Hilton to hear what the richest man on earth would have to say. The BBJ writes "There were enough ambassadors to hash out a global trade deal with dignitaries from Australia, the United Kingdom, Greece, South Africa, Panama, Indonesia, Azerbaijan, Singapore and many more" and that "there were enough developers and real estate captains to fund and build a second nation's capital alongside the first one". DC's Mayor Bowser said "We are eager for any announcements he might have.” Well, he didn't have an encyclica, nor any announcements regarding HQ2. 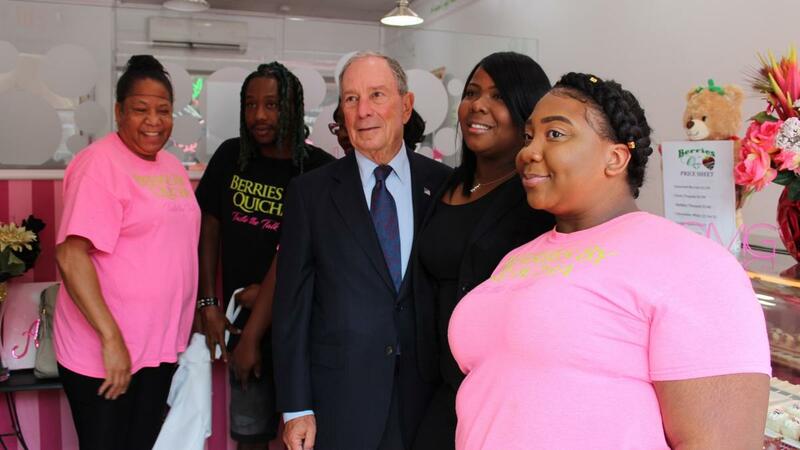 A smaller affair was Michael Bloomberg's visit to Baltimore earlier this summer. The wealthy man has shown the world how to run a city as mayor, but he also has a lot of resources. No doubt, Baltimore could be glad if the city would be run nearly as smoothly as New York. With 12 times as many residents, New York City has a lower number of murders than charm city. Bloomberg is strongly tied to Baltimore through his alma mater, Johns Hopkins and has selected Baltimore as one of his Bloomberg cities. 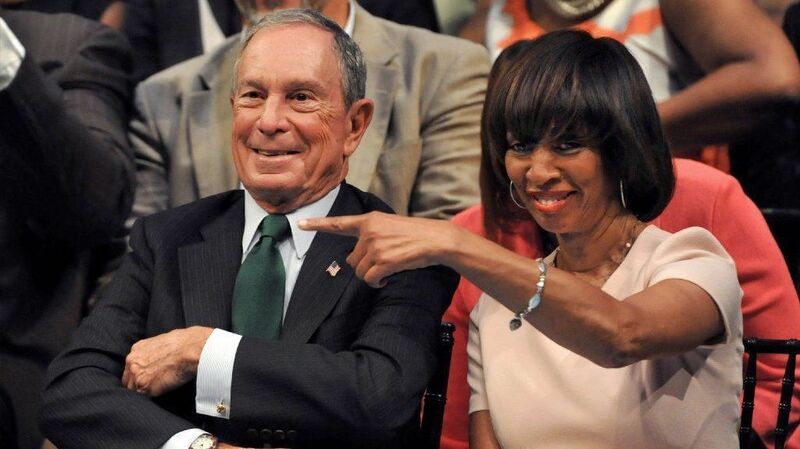 Baltimore is receiving technical and monetary assistance through the Bloomberg Philanthropies. In September Bloomberg announced the recipients of a $43 million Arts, Innovation and Management program. 49 arts organizations received money, the bulk in Denver, the others here. Baltimore is the recipient of a $5 million Bloomberg Innovation Grant. The philanthropy has also sent Innovation Teams here to assist with running a more efficient government and a better police department. The team tried to help with the selection of a leader for the then vacant position of DOT Director, however, Mayor Pugh eventually selected her own find. In August Bloomberg toured a bit of the City and had breakfast with graduates of a Goldman Sachs business program at the SoBo Cafe in Federal Hill. He told the BBJ nice things about our Mayor: "she is doing everything she can to improve [Baltimore]" he reportedly said and that Pugh "got guts". With the police department in disarray and without a permanent Commissioner and now the highly successful health department also with out a leader, the question of picking the right appointments is again before the Mayor, this time with even bigger urgency. Baltimore knows already that Bezos won't kiss the frog with selecting it for his $5 billion HQ2, and has to make do with the crums falling off Amazon's huge distribution centers in City and County. Baltimore is also a recipient of significant funds from George Soros through the Open Society Institute. 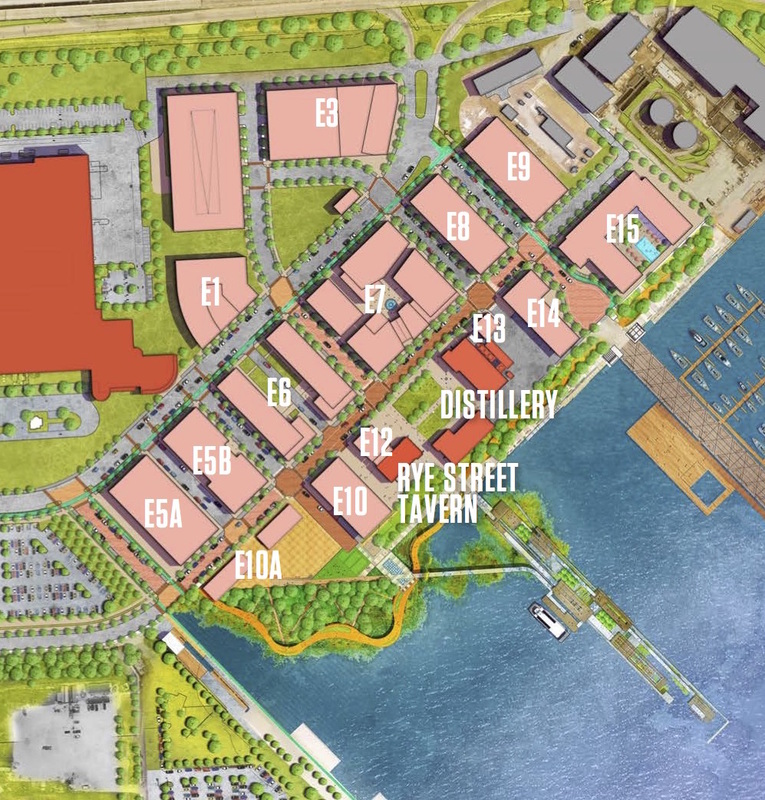 The City still also puts big hopes into one of its own business leaders, Kevin Plank, and his envisioned new HQ as part of an entire new-town planned for the Port Covington former coal transfer railyard. Like Tesla's Elon Musk, or Uber's first CEO, Plank seemed to be on a trajectory of never ending success. But as with Musk, or the former Uber CEO, public darlings can easily encounter strong public headwinds. Icarus comes to mind, the mythical Greek high flyer who got too close to the sun and crashed when his melting wax-tied feather wings didn't carry him any longer. While Musk's hyperloop tunnels are praised as the next big thing by Maryland Secretary Rahn as the latest transportation innovation, Plank has stopped to say much about Port Covington where Hyperloop would likely end. Plank is busy placating his shareholders who are upset about sinking ticker prices. Sagamore Development is now Weller Development (although the delineation isn't entirely clear if one studies those two websites) and it isn't clear either, whether Plank is still personally vested in either of those endeavors, or whether today money just comes from Goldman Sachs. 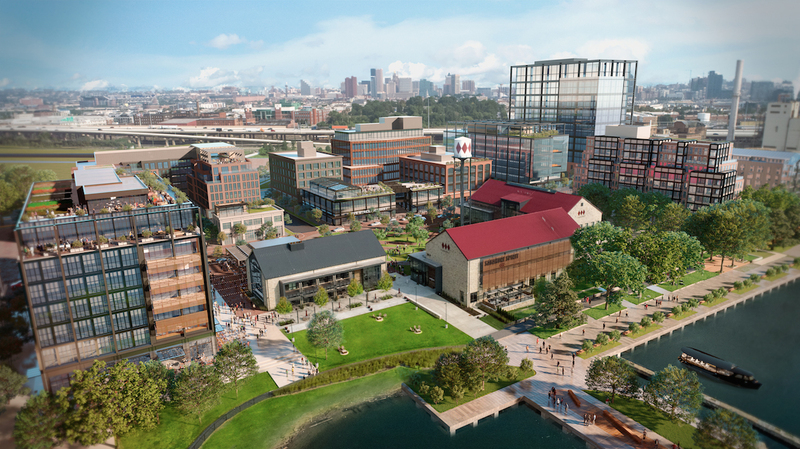 Nothing is known about when work on the planned Under Armour Headquarter would begin, originally scheduled to begin in 2017. There has been no further mention of the planned light rail extension into the property. Funding for it had been rejected by the federal government last year and one would have expected another run this year. Weller must have felt that the guessing game became a liability, so he gathered the media this week to announce "Chapter 1" of Port Covington, a sizable 3 million square feet of development (Larger than the full build-out of HarborPoint) to get underway in 2019 with opening dates planned for 2020 or 2021. Chapter 1 sounds similar to Chapter 11, even if the message is the opposite. However,the announcement didn't provide names of any developers or tenants. Adjusting for the fact that the Baltimore SUN facility in the middle of Port Covington seems to not go anywhere anytime soon, Chapter 1 does not replace the SUN printing facility with the tallest skyscrapers as in the original plan but works with the SUN in place. When the Port Covington project was initially proposed, Sagamore had stressed that they would not develop the new town themselves but look for developers to buy development-ready parcels. The Chapter 1 concepts went to the City's design review this week, more specifically, the infrastructure portion and streetscape design was reviewed. Weller Development will tap into the large tax increment financing (TIF) package to pay for infrastructure in Chapter 1, but the specifics for that are also still being negotiated with BDC. The price for the TIF is a historically large community benefits agreement. Those funds will flow to the "SB 7" community only at the rate as the TIF will be used. Whether rich Seattle, San Francisco or poor Baltimore, cities should not rely on the big money guys as their saviors. Too fast, too risky is the world of big business, too volatile public opinion. While it is laudable, necessary and welcome that rich men consider social impact, invest in legacy cities, especially if they are their home community, Mayors should not roll over or defer their responsibility to the corporate giants and philanthropists. Instead they need hedge against changing trade winds, against dangerous dependencies and against the believe that there can be the one savior who can turn things around. History has already amply proven the risks of economic mono-cultures (ever heard of Bethlehem, the steel town or of Mo-town? ), but present time represents even higher risks thanks to hyper accelerated business cycles. True recovery of the deeply wounded legacy cities, still reeling from decades of de-industrialization and a history of institutional racism, can only come from being positioned in a truly diverse and inclusive manner. A solution cannot be imposed by whatever rich guy savior may be out there, the impetus for change, growth and innovation must come from within. This insight doesn't make corporate investment unwelcome, it doesn't condemn private-public partnerships, it doesn't turn social entrepreneurs into the bad guys, it just recognizes the reality, that a resilient, sustainable and just urban future requires the social foundations of a community to be made up by a sound social infrastructure. In that sense, not having HQ2 and a maybe slower development of Port Covington provides an opportunity and not a curse. 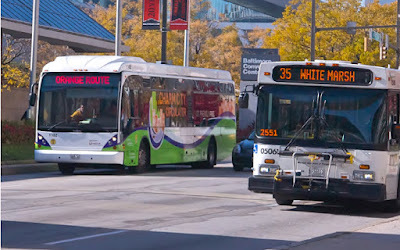 The days when Baltimore's very own Charm City Circulator bus system could easily upstage the MTA and demonstrate how cool transit could look are long over. From being one of Baltimore's jewels it slid into the position of unloved stepchild in the eight years of its existence. Baltimore bus transit woes. Circulator in trouble. Now ultimate trouble is in sight. 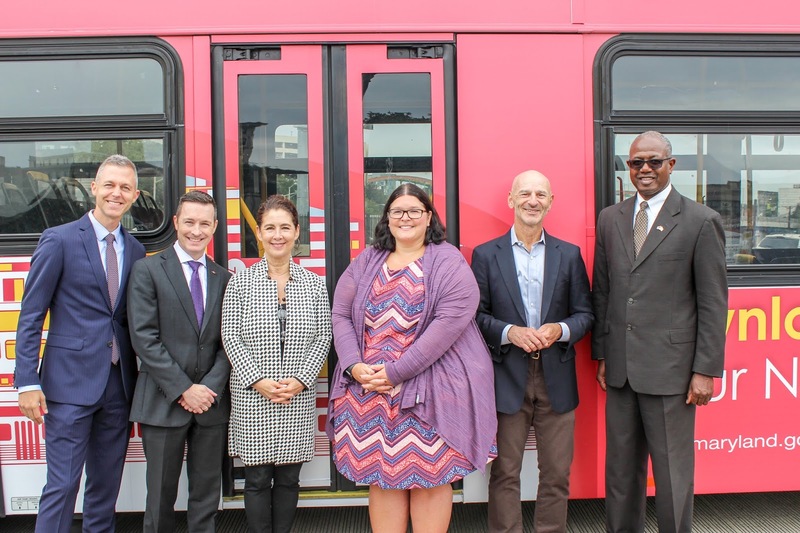 The operation contract held by the multi-national Transdev Corporation (formerly known as Veolia) expired in January and an extension will expire in October. But a real bombshell exploded today. The City has been stewing over the two bids it reportedly got in response to its request for proposals (RFP) since April. As noted in an earlier article on this blog, the RFP did not ask bidders to identify the best services they could offer based on a defined sustainable budget (the current operation runs a loss, at least if bus payments and renewal are included in the budget) but was prescriptive in telling bidders what service they had to provide and even prescribed a certain number of buses to do so. The RFP was mum on the bus garage and maintenance facility that is needed to run a fleet of buses. Current operator Veolia has a lease on such a facility, any competitor would have to find one starting with the moment it would begin operation. Not an easy proposition given that bus garages are rarely sitting around for the picking. The process of vetting the bids came to a sudden end with a press release coming out at 5pm today containing explosive news. The City is suing Transdev/Veolia for breach of contract and overcharging $20 millon for the operation of the Circulator. The dispute seems to center around te question whether Transdev rightly charged for scheduled services or whether the City's position is correct that they can only charge for actual services. This sounds clear cut (how can you charge for a service you should, but didn't provide?) except that there may be external reasons not to run a service that Transdev couldn't control, situations where the operator still occurred cost even if a bus run didn't happen and the like, all something that the courts will now look at. The number is so large because the City disputes all eight years during which time it had accepted the schedule based billing. 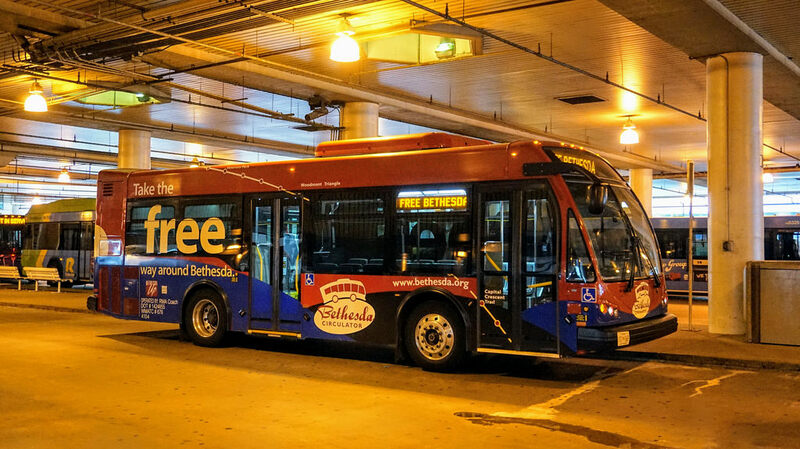 On March 28, 2018, the Board received two proposals for B50005328, Baltimore City Shuttle/Transit. Vendors were solicited by postings on CitiBuy, eMaryland Marketplace, and in local newspapers. The above noted proposal met the City’s minimum technical score requirements for price opening, and was determined to be the sole responsive and responsible proposer. The legal matter certainly eliminated Transdev from being the favored bidder. The City is now negotiating with the second bidder, RMA Worldwide, a Montgomery County based VIP Limousine service which also runs the Bethesda free Circulator. It doesn't take much to imagine the train wrecks that are possible once the Veolia extension expires on October 11. Additionally, further State support for the Circulator on which the City came to rely, could be in jeopardy if no viable operation of the City system is in sight, especially since the State already saw their support of bikeshare evaporate into nothing. Anyone who cares about Baltimore's precarious transit conditions must be concerned about a situation where a good outcome is hard to imagine. The option to negotiate yet another extension to the current operations contract, nix the current RFP, and rebid the project on an outcome and performance base instead of a prescriptive basis is out the door with the law suit. No new operator will be able to take over the operation when the Veolia contract extension ends in the first half of October. A patch operation with loaner buses from various local tour bus operators without a proper coordinator seems to be the most likely outcome. It is difficult to imagine how the service can recover from such a blow. Circulator riders better hold on to your seats. Your ride may or may not show up come October 12.
updated for link to Baltimore SUN article and Board of Estimates quote. updated to correct statements about RMA Worldwide. It does operate a bus service, the previous statement was incorrect. A somewhat outdated report about the service from 2008 can be found here. Baltimore City has filed suit against Transdev North America, Inc., and Transdev Services, Inc. (“Transdev”) for breach of contract. The lawsuit alleges that Transdev overcharged the City more than 20 million dollars for the operation of the Charm City Circulator, the free shuttle service available to City residents, downtown employees, students, tourists, and anyone who wants to ride. This lawsuit reflects the Mayor’s priority to increase transparency and accountability in government dealings. 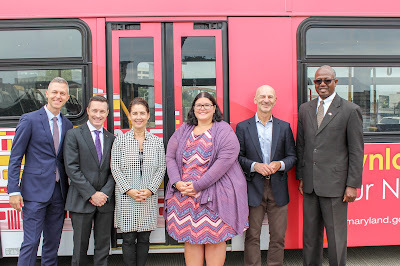 The City determined that instead of invoicing the City for the hours it actually operated the Circulator, as the agreement for the operation of the Circulator required, Transdev invoiced the City for thousands of hours more for passenger transport. Transdev’s overbilling practice resulted in the City overpaying Transdev over $16 million since 2010. The City’s lawsuit seeks compensation for the overpayment. The lawsuit was filed this morning in the Circuit Court for Baltimore City. The City has asked that its claim for breach of contract be decided by a jury. Transdev is expected to be served with the lawsuit this week. The Baltimore City Department of Transportation is in the procurement process to select a vendor to provide the Charm City Circulator bus service. The new contract duration will be for 3 years. Following today’s Board of Estimates actions, the negotiations between the city’s Bureau of Procurement and the selected vendor will begin immediately. If the subsequent negotiations are concluded successfully, it is anticipated that the new contract will be awarded by October 10, 2018. DOT is committed to the continuity of service and is taking immediate actions to provide bus bridge services while negotiations are completed and service begins with the new vendor. The Department of Transportation will be utilizing local companies to provide the bus bridge service until a permanent vendor is ready to begin full operations. During this time, citizens will not see changes in existing service locations, schedules or hours of operation. However, citizens should be aware that some of the buses in operation after October 11, 2018 may differ slightly in size and/or design from the original Charm City Circulator fleet.